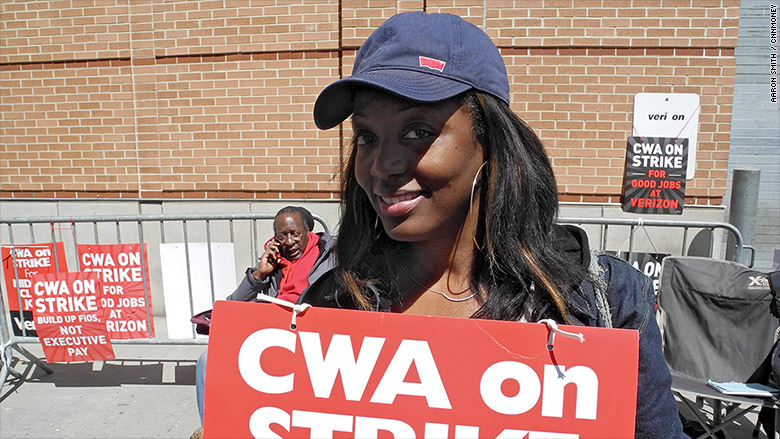 At least 36,000 Verizon workers have been on strike since Wednesday after failing to reach a new labor agreement by the contract's deadline. Among the union workers' list of complaints: the offshoring of thousands of jobs to workers abroad, outsourcing work to low-wage, non-union contractors and the closing of call centers in the U.S. But one of their chief complaints is about being forced to work in locations far from home for months at a time. Verizon lineman Ting Chin, who already commutes more than 80 miles from Poughkeepsie, NY, to Manhattan, said that several of his colleagues were sent to Buffalo, New York -- almost 400 miles away -- for a long-term job, a fate that he says he narrowly avoided. "They want to pick and choose who they want to send and they want to be able to do it at any time," he said. When asked about the Buffalo assignments, Verizon (VZ) spokesman Raymond McConville said "I think they may be exaggerating the distance a bit." "We've been asking for more flexibility in how we can move employees to where they're most needed," said McConville. "For example, right now, if there's a big job in Manhattan, we can't take technicians in Hoboken and send them across the river to help out. We need common sense flexibilities like that added to our union contracts." McConville wouldn't confirm specifics on how far employees would be moved for work or for how long. But he did say the company would take the option to move employees for long periods of time "off the table once they sign a contract." The company added that the workers have a wage and benefit package that averages more than $130,000 a year. McConville said the employees "make very modest contributions" to their healthcare premiums, but the company "bears the vast majority of all employee healthcare costs and will continue to do so." 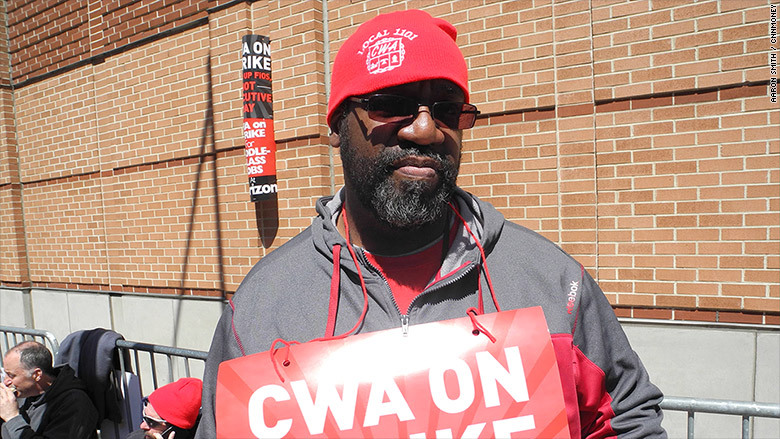 Why I'm on strike: "The company wants to send us over 100 miles away from our families to work at a given moment whenever they feel like it." 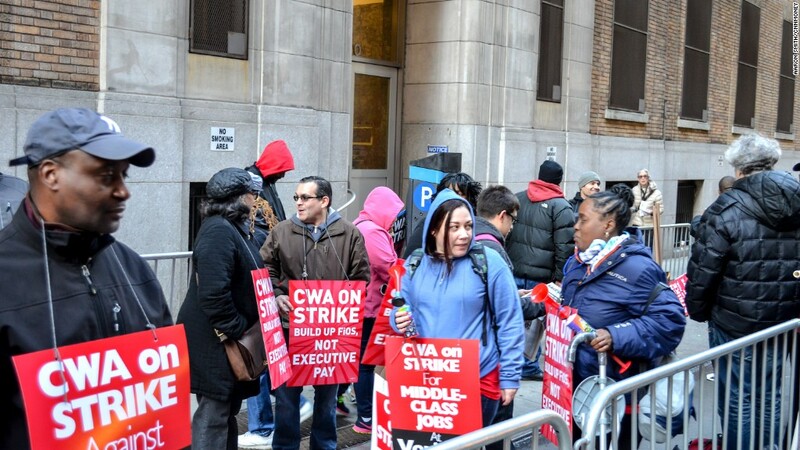 Why I'm on strike: "Job security, cost of living increase. Nobody wants to just be told you've got to go someplace you never heard of. They want to be able to send you another 100 miles for your work location." 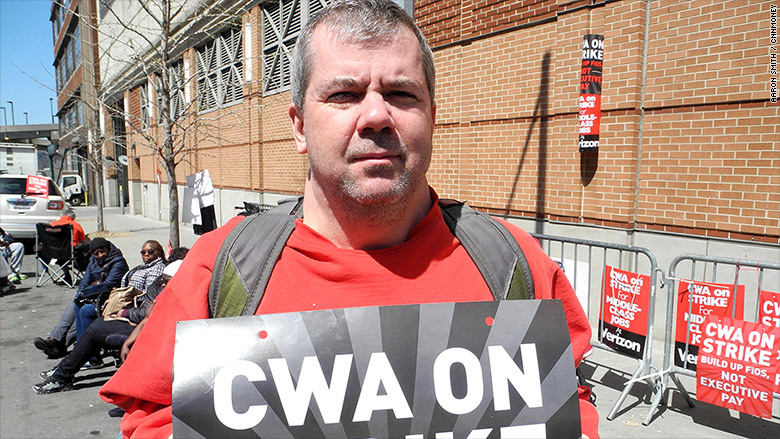 Why I'm on strike: "Because they want to take my benefits. They want to take me anywhere from Massachusetts to Virginia at a moment's notice for three months at a time. [Rooney also complained that Verizon wants to freeze pensions at 30 years even though it makes multiple billions of dollars a year in profits.] "I don't know how they're crying poverty."